Is it time for the Tooth Fairy? There are a lot of things to consider when the issue of children losing teeth is addressed. Parents and children, alike, are curious as to when it will first happen, how it will happen, and which tooth will be first. While it's not entirely predictable, with a little knowledge, the experience can be one that is not only exciting, but explainable, too. Typically, a child loses his first tooth between the ages of 6 and 7 years of age. If a child was early to teethe as a baby or attained all his baby teeth early, he may be prone to lose his first tooth as early as age five. According to pediatric experts, most children lose the two bottom front teeth first. The next ones to go are usually the top two front teeth. Other patterns may occur, but this is the most common sequence. Generally, children have lost all of their baby teeth by the time they are 12 or 13 years of age. The term "shark teeth" refers to a child's permanent teeth starting to come in before the baby teeth come out. This is not a serious situation unless after a week or two the baby tooth does not appear to be loosening and preparing to come out. Generally, a tooth will loosen to the point it will fall out on its own. 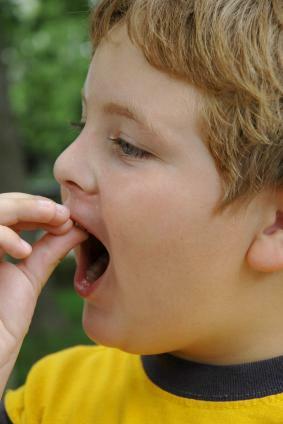 Numbers of children have reported teeth falling out as a result of whistling, eating or talking. Others deliberately pull their teeth when they are ready. There is usually never a need to "force" a tooth out until it's ready to fall out on its own. A child does not typically experience pain when a tooth is loose and getting ready to fall out. However, once in a while, gum discomfort is experienced. This can be alleviated with over the counter pain relievers such as ibuprofen (Advil, Motrin or others) or acetaminophen (Tylenol or others). Proper care of their teeth should have been learned during early childhood, however, it becomes even more important as a child's permanent teeth begin to come in. Limiting sugary treats, learning to brush and floss and overall dental care become even more important at this stage. As permanent molars come in, it's a smart idea to have a sealant applied by your dentist. For children, this is an extremely exciting time. The loss of a tooth generally means a visit from the Tooth Fairy. There are various ways the Tooth Fairy visits, but the visit is very important. Typically, the Tooth Fairy gives more for the first tooth than the ones to follow, as the first one is the most valuable. It's debatable about how much to give for each tooth. Some parents indicate that a quarter per tooth is adequate, while others give dollars for each tooth. It's entirely up to you, as the parent. Additionally, the loss of baby teeth gives children a sense of moving into being a "big kid." It's very important to support them during this stage. Lots of milestones are yet to occur, but this one of losing the first tooth is definitely a memorable one for you and your child.